It so nice to have guests. I know it takes time to prepare but I love this smell of clean house, fresh flowers on the table and amazing smells coming from the kitchen – mix of homemade bread, Indian spices and chocolate brownie. Last week we had my husband’s relatives visiting us. I wanted to spoil them and cook something Indian, to be even more specific South Indian dishes. To my own surprise, it came so deliciously gooooood! But particularly I was surprised by one dish that I am going to share with you just now. It is not really Indian dish but I used Indian ingredients so I guess it counts 🙂 This was the first time I made it and as an experiment it came amazing – well to my taste. Only I have to apologize for the pictures because I am eating left overs at the office, so the pictures are not so attempting as the food really is. 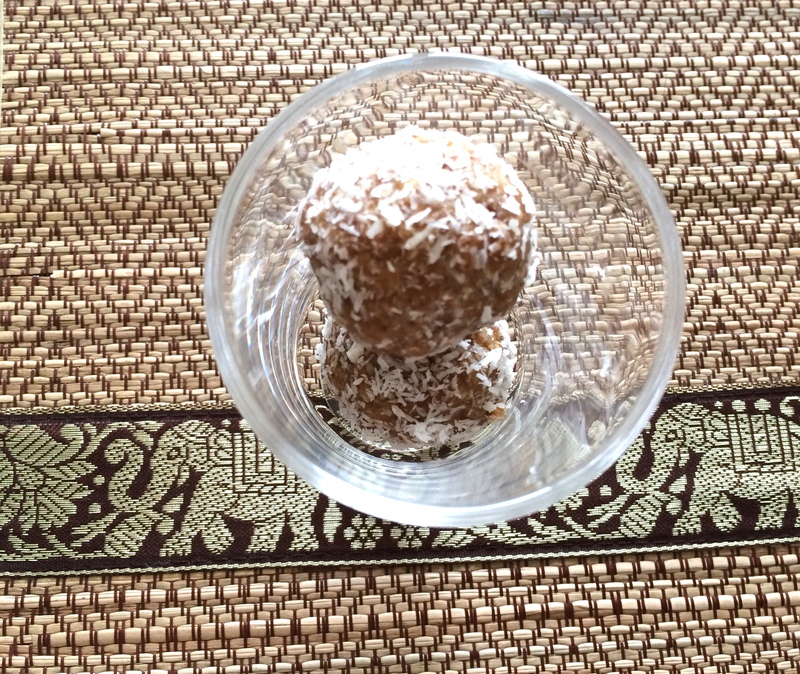 So, this amazing recipe, I called Coconutty Dhal. What do you need? How does it cook? Firstly, fry chopped onions and ginger in the pan. Let them roast nicely until the yellowish color. Prepare the sweet potato, grate it or chop it in cubes and add to the onions – let them soften. Please leave on a small fire that it would not burn. While this is cooking, boil red lentils (add jeera seeds) for few minutes until it slightly softens and switch of the heating. Once the potato softens add dhal and coconut milk and let it cook on a small heat. Please stir often as dhal likes sticking on the pot. Add salt according to your flavour. The best is to keep overnight and eat it next day. It goes very well with rice, buckwheat, mashed potato or simply bread. You will make a lot, but enjoy it for a week or freeze in the freezer. Ps. I have not used any spices and the taste is very good. But please experiment your own flavours and share with us. Someone called it a birthday cake. Would I make it for my birthday? Maybe, but because I love lemon cakes. But if you are not a fan of sour tastes I guess you would go for another taste for your birthday. Sour taste – oh, yes! I absolutely love deserts that is made from lemons and always try and experiment new recipes. This was adopted from The Stone Soup website. Thank you! I made it this week and couldn’t stop eating. Again we come to those recipes that requires only few ingredients rather than a huge list. Fewer ingredients dishes tend to be healthier. Of course, if they are not full of fat and sugar. Actually, this one has some of just mentioned. But I am working making it healthier. My brother always scared to eat my cakes because they are too ‘healthy’ for him. Preheat the oven to 180 degrees. Cream butter, coconut butter and sugar. Add eggs one at the time. Add almond flour, lemon zest, juice, baking powder and poppy seeds. Stir everything very well and add the batter to the tin covered with baking paper. Bake for 45 minutes. Leave it to cool in the tin. I didn’t have patience and tried while it was still warm. Oh, if was delicious. With some coconut, dairy free ice-cream! Oh, how delicious it was. But wait, the leftover cake I kept in the fridge and tried it cold. Wow, that was something so delicious that I didn’t taste for ages. My suggestion you have it cold, from the fridge. But what ever option you chose – it is so good. Forgot to mention – this cake is flourless! I love green colour! I can say that it is one of my favourite colours. What is your favourite colour? If you been following my blog you might have found quite few green recipes. Here is again a green one. I found it recently and absolutely love it. I love cooking only from few ingredients therefore this recipe is even more tastier. At least for me. My husband says ‘If only we could improve the colour’ it would be even more amazing dish. Ha ha! I actually like this colour, it reminds me of forest grass colour. Oh, well, enough about the colours, let’s get the recipe here! Didn’t I tell you how simple the recipe sounds. And believe it or not but it tastes amazing. I didn’t use too much of seasoning – mainly caraway seeds, herbs like oregano, basil and salt. As simple as that. Start cooking: fry garlic, then onions and mushrooms. Useful tip – you don’t need to chop everything very finely because at the end we will put the soup in the food processor and blend it. So chop so that could fit in the pot and fry. Once you smell a mushrooms you can add chopped broccoli. Add boiled water and boil together with herbs. Boil until broccoli gets soft. Let it cool and blend it all together. I also added few spoons of soya powder. You can add some milk or cream also when you dish the soup on the plate. I served it with toasted bread and humous. Also added some seeds like roasted pumpkin seeds. To give some flavour you can add yeast flakes or grated cheese. Enjoy and don’t by shy to add your extra flavour. We all know that breakfast is the most important meal in the day, don’t we? Our super brains after the night sleep need energy and breakfast is a perfect way to boost them. Not to speak about water – we start a day with a glass or two of water, isn’t it? I love water and I usually keep my water bottles next to my bed so that once I wake up I could have a first sip of water and continue drinking until breakfast. However, this time I am not going to talk much about breakfast but I would like to share an amazing recipe for breakfast which you can prepare in advance and enjoy in the morning. It is true that we all have very busy mornings and sometimes we leave breakfast aside. If we only spend some time in the evening or other part of the day that is less busy for us and prepare some food that we could eat during breakfast that would be perfect. I always look for some healthy and very nutritious ways to start the day. Since summer we’ve been drinking smoothies for breakfast. But at least from our experience it is not enough to keep you going until lunch. So I started doing nut balls and have few of them with smoothie. Oh, such a delicious breakfast! But it is good to have a variety and I started thinking of making other types of ‘energy’ balls. And decided to improve my two ingredients biscuits recipe. Aaah, the result was stunning! I baked them on Wednesday, today the box is empty. It simply disappeared, I think not only eating at breakfast time. Few additional ingredients made them so delicious. I have to bake again and this time keep them in better place so that we could have mainly for breakfast. Why? Because it is so easy to have them with smoothie and no need to do any additional dishes. First, I mix very well oats and coconut butter until you can’t see the butter. Then, I grate bananas; or you can smash with a fork, or use a hand blender. Thirdly, I add bananas to the oats mixture; again mix very well and add all remaining ingredients. Finally add honey and mix again. Once the dough is ready start making the cookies. Bake them for 15-20 mins at 170C temperature. Happy breakfast! Happy Cookies! Happy weekend! It is time to treat yourself. And not only yourself but also others. However, it is sooooo delicious that you might decide to keep somewhere secretly and enjoy only yourself. My family absolutely loves them. We also call it energy balls that we take each or two every morning. AS they say it is a great way to start the day alongside homemade smoothie. Nuts’ balls recipe was adapted from the Fit Food Finds website (thank you Lee). But it also added additional taste from me 🙂 The recipe is very easy and it so much fun to do it with your children. It is a great way to spend some time together and also prepare something very delicious. Place the nuts on the pan and roast until you start feeling the smell of nuts. Then add more than half of the coconut to the pan and keep roasting together with nuts. Make sure you are roasting on a small heat because it is very easy to burn the nuts. You can also toast the nuts in the oven but always be near it as again it might burn too quickly. Once you roasted the nuts leave them to cool. Place the dates in the food processor and blend them very well. If you haven’t gotten medjool dates, but you have dried dates. You can use them too but before you should soak them in water. If you soaked them in water, do not forget to remove the water and let them dry properly. Then separately put nuts in the food processor and keep there until the nuts are finely chopped. Then add dates and finally peanut butter. Mix everything well – can do with food processor or with spoon either clean hands. Place remaining coconut on the plate then, start shaping nuts’ balls and roll them in coconut. All the balls put in the container and keep in the fridge. I wrote the ingredients however, I always mix and experiment. 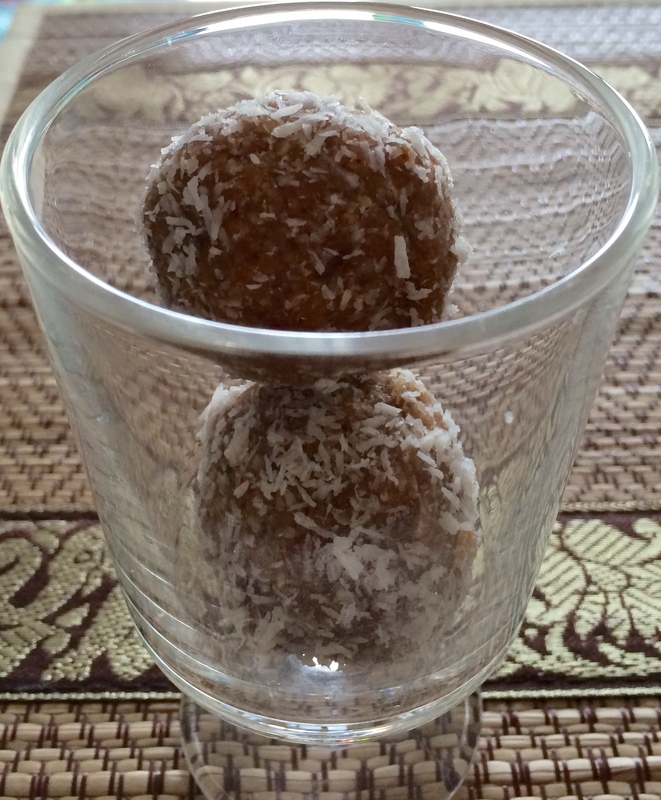 Recently I made these balls using macadamia, pecan nuts – tastes very good! 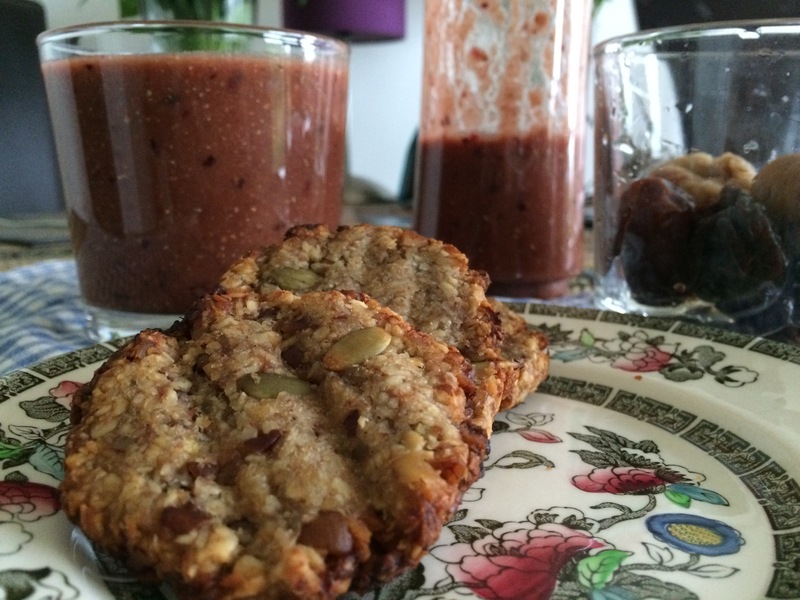 I also added seeds – linseeds and sesame seeds. And you can always add more coconut because it is very healthy to our bodies.